Home-made Instant Hot Chocolate mix. Spiced hot chocolate for a wintry afternoon. It’s winter here and I’m sick. These two things may or may not be related. Either way, it’s the time of the year when a warm drink or two is more than welcome. The Boy is quite partial to those hot drink mixes that come in individual sachets. However, we’re saving for a house. That means luxuries are something to look forward to in the deep, distant future. He looks cute when he mopes. Let’s deal with packet mix ingredients first. I copied this little snippet from the website of a leading hot chocolate mix-maker. 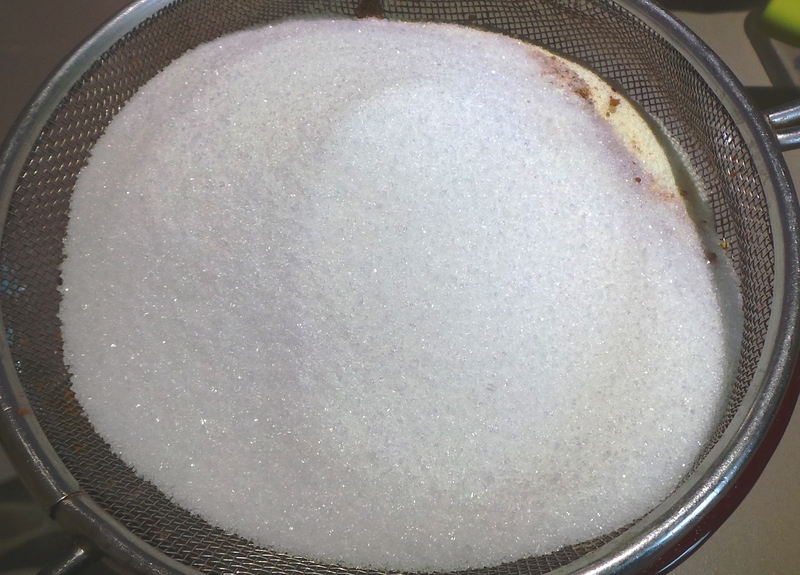 Sugar, Milk Solids, Beverage Whitener [Glucose Syrup, Vegetable Fat, Sodium Caseinate (Derived from milk), Mineral Salts (340, 452), Emulsifier (471), Anticaking Agent (554)], Cocoa (10%), Salt, Mineral Salt (341), Flavour [Vanillin (contains milk)], Spice. Can you see all that sodium in there? Also, a lot of these additives are synthetic. Eat real food, people. Here’s a start. 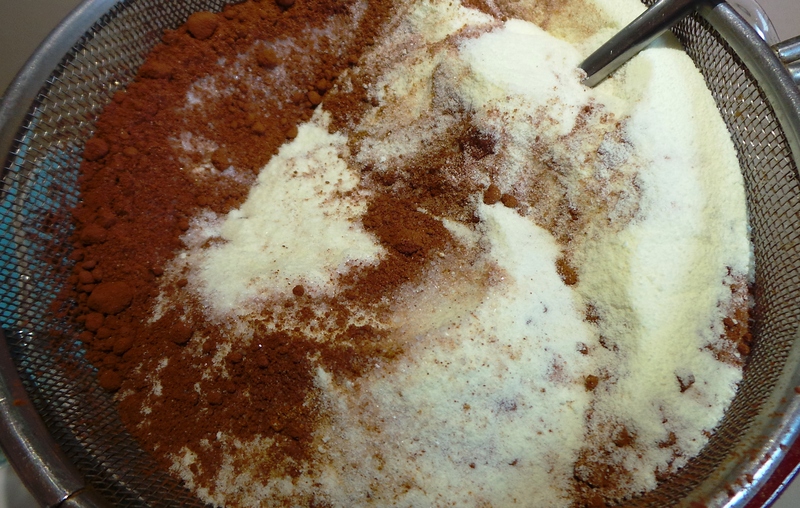 At its most basic level, this stuff is a mix of milk powder, cocoa and sugar. I used skim milk powder, because a lot of it will be drunk (by one person who isn’t doing a lot of outdoorsy stuff in this chill…). You may use full-fat should you so desire. 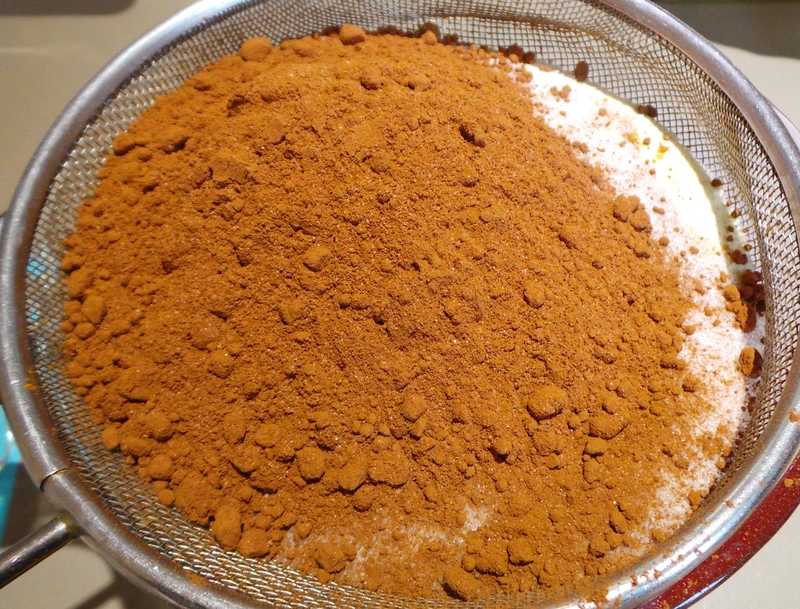 I like to make my hot chocolate with a few spices. 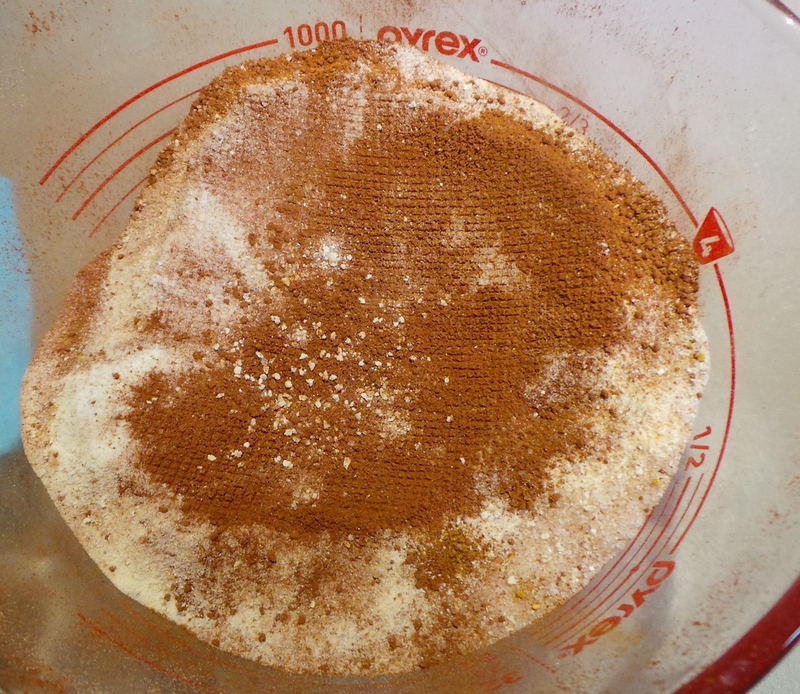 I add cinnamon, ground cardamom, ground ginger and a touch of nutmeg. You don’t have to add any – or all – of those. 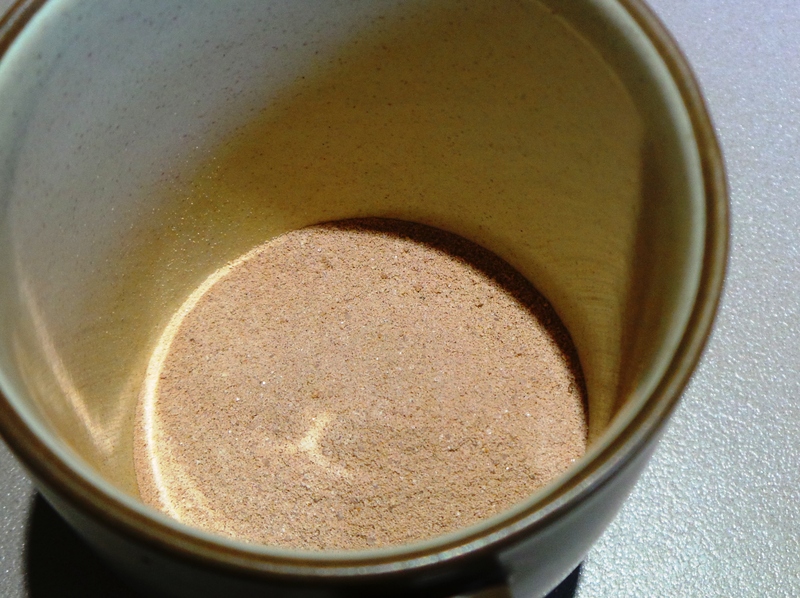 On the other hand if you like, and own, a pumpkin pie spice mix, then add a few teaspoonfuls of that. Make it your own. Start with a bowl with at least a 4 cup capacity. 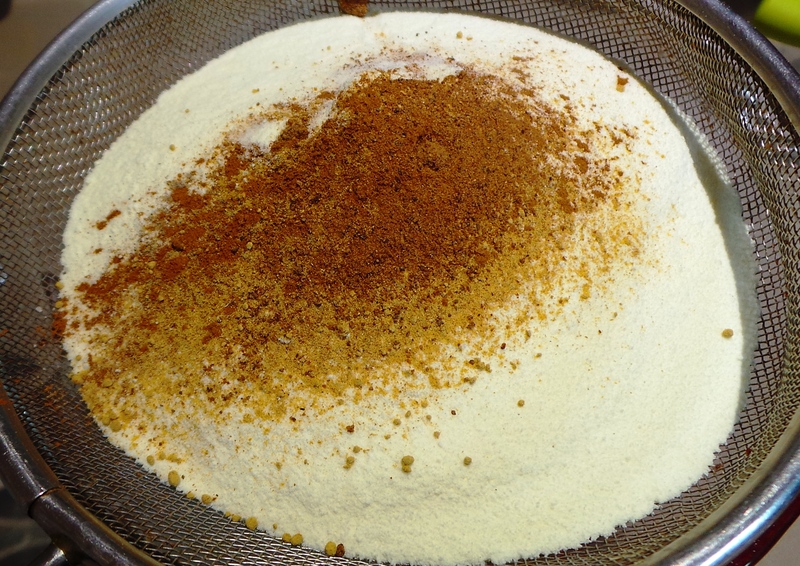 You want something you can sift your dry ingredients into, and then stir them up, without it going all over the place! Place a sturdy wire sifter into the top and add your ingredients. Try to wait until they are all in there before you sift them through, this will assist with getting them all well-mixed. 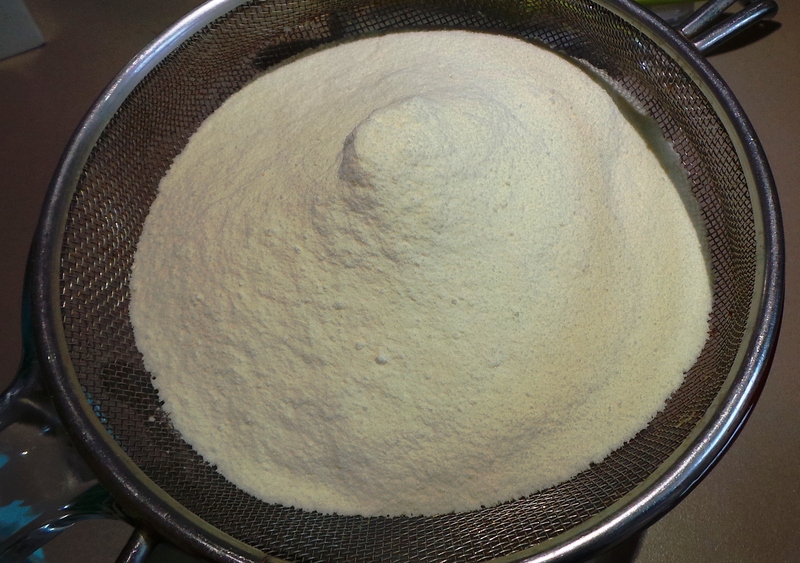 Start with 2¼ cups of milk powder. 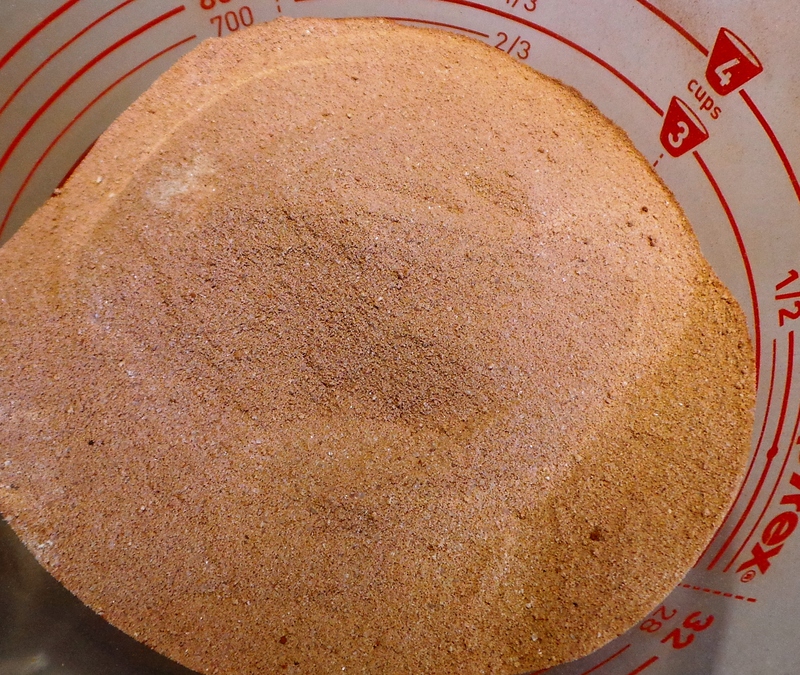 Next add your spices; about 1½ teaspoons worth. Add whatever combination of spices you like. Or not. Next a touch of sugar. Sugar. Actual sugar. Not salt. And finally, the cocoa. This can be whatever type of cocoa you like: Cadbury, Dutch process, or whiz-bang, ultra-organic cacao. Whatever. The chocolate part of Hot Chocolate. Now, sift it all together, stirring with a spoon to help the mixing process. When you’ve finished, it will look a little like this. Mix it up a bit more. You can’t break it. 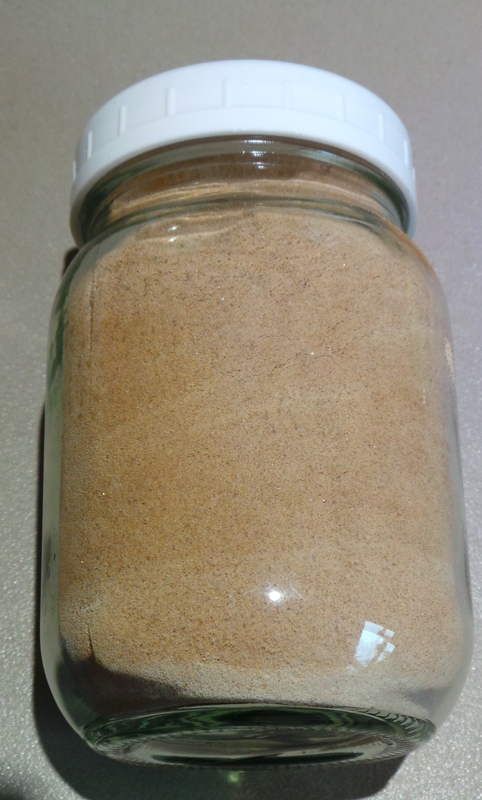 When it looks like this, pop it into an airtight container until you are ready to use it. I used some mason jars, because that’s what I had handy. Give it a good shake once it’s all sealed up tight. Then, place a few tablespoonfuls into a mug, add boiling water and stir well. Relax. The hard work is over now. Sift all ingredients together and mix well. To serve: Add boiling water to 3 tablespoons of the mix. Love this ideas Sharon. Would be super easy for my kids too now they are getting older. I think it’s the perfect thing for kids to be making in the kitchen, Caz. Just be warned that it could lead to the purchasing of mini-marshmallows..! So glad you liked it, thank you for letting me know!